They are the JUSTICE LEAGUE DARK ... and they're in trouble. The mystical gateway known as the Tree of Wonder has opened a door, and something terrifying has come through. This evil entity will turn all of existence upside down. Magic is dying on Earth, and unless this strange new League sets it right, humanity will die with it! From the creative team of writer James Tynion IV (Batman/Teenage Mutant Ninja Turtles) and artist Alvaro Martínez Bueno (Detective Comics) comes a bold new vision of comics' most macabre team! 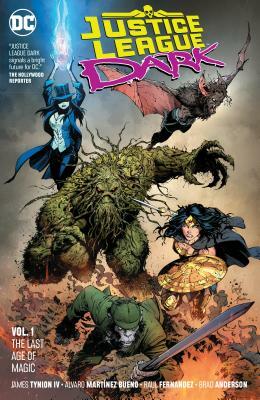 Spinning out of Justice League: No Justice and Dark Nights: Metal, this new-reader-friendly opening volume collects Justice League Dark #1-3 and #5-6. James Tynion IV started in the comics business assisting Scott Snyder in writing backup stories for Snyder's groundbreaking Batman series. Tynion soon began writing Talon, a series that spun out of the hugely popular "Batman: The Court of Owls" storyline. He has also written Batman: Detective Comics, Constantine: The Hellblazer and Red Hood and the Outlaws and is currently at the helm of Justice League Dark.